In this lesson, we will learn how to find the slope from two points or a graph of a function and determine whether the slope is positive, negative, zero, or undefined. 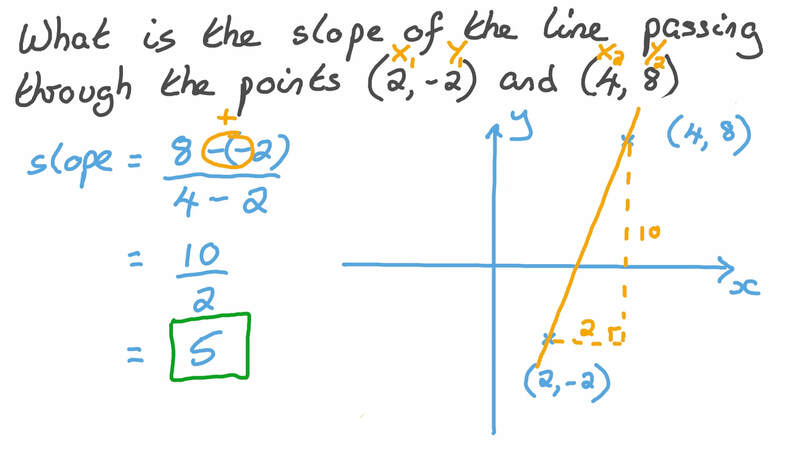 What is the slope of the line passing through the points ( 2 , − 2 ) and ( 4 , 8 ) ? The graph shows the capital of a company over 8 years. 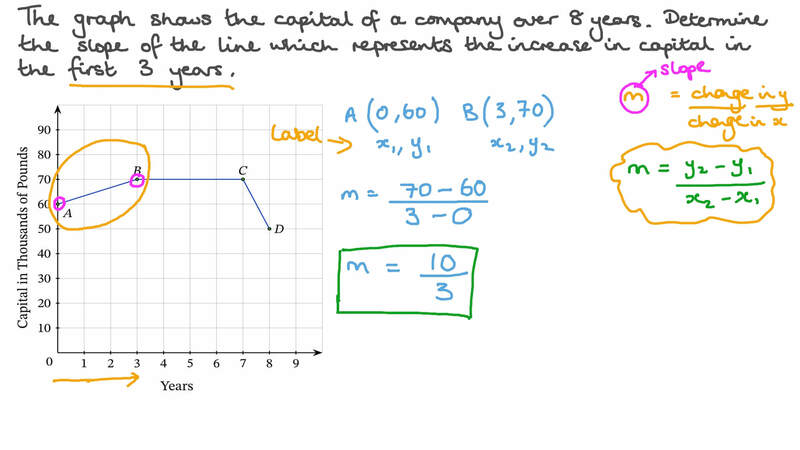 Determine the slope of the line which represents the increase in capital in the first three years. Consider the four points 𝐴 ( 1 , 2 ) , 𝐵 ( 6 , 0 ) , 𝐶 ( − 1 , − 2 ) , and 𝐷 ( 3 , − 4 ) . Work out the slope of the line ⃖     ⃗ 𝐴 𝐵 . Work out the slope of the line ⃖     ⃗ 𝐶 𝐷 . Line 𝐿 passes through points ( − 1 , 2 ) and ( 2 , 3 ) , and line 𝑀 passes through points ( − 1 , − 1 ) and ( 5 , 1 ) . Work out the slope of line 𝐿 . Work out the slope of line 𝑀 . What is the slope of the line passing through the points  2 , 2 3  and ( 6 , 2 ) ? Calculate the slope of the line in the graph. What is the slope of the line in the given graph? 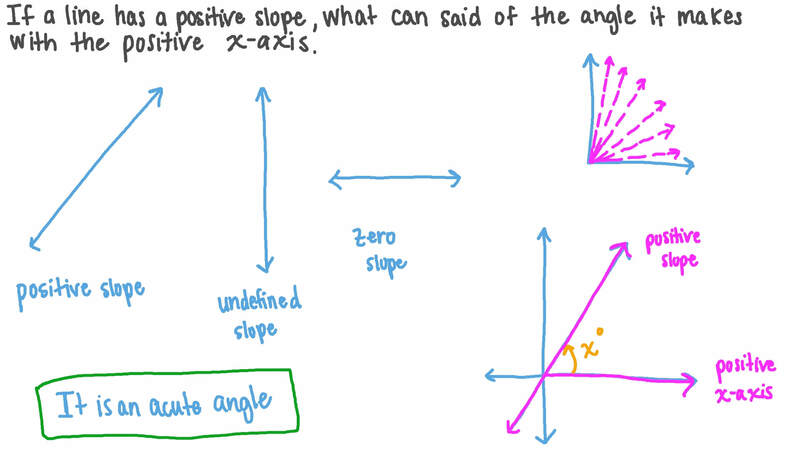 If a line has a positive slope, what can be said of the angle it makes with the positive 𝑥 -axis? AIt is an acute angle. BIt is an obtuse angle. CIt is a zero angle. DIt is a right angle. In this figure, the slope of ⃖     ⃗ 𝐴 𝐶 is . Consider the two points 𝐴 ( 𝑥 , 𝑦 )   and 𝐵 ( 𝑥 , 𝑦 )   . Find an expression for the slope of the line on 𝐴 and 𝐵 . Find the slope of the line segment connecting the points ( 3 , 4 ) and ( 5 , 7 ) . Give your answer as a fraction in its simplest form. What can be said of the slope of a line that is parallel to the 𝑦 -axis? CIt is − 1 . In this figure, the slope of ⃖      ⃗ 𝐴 𝑂 is . In this figure, the slope of ⃖     ⃗ 𝐵 𝐶 is .